There have been sightings of white whales sporadically over the last few decades, but the only white killer whales (Orcinus orca) were young, including one with a rare genetic condition that died in a Canadian aquarium in 1972. A group of Russian scientists and students on a research cruise off Kamchatka made the sightings of an adult O. orca. The only two other white orcas seen in Russia were young, but this time, researchers are sure it’s an adult they’ve spotted. 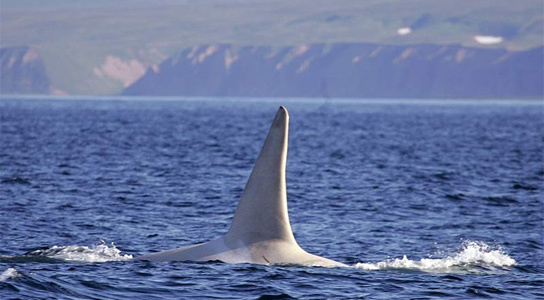 The dorsal fin measured two meters in height, implying that it’s at least 16 years old. The fin was somewhat ragged, so it could even be older. Male killer whales can live up to 50 or 60 years, though 30 is the median life expectancy. They mature at the age of 15. The researchers have called him Iceberg and he seems fully socialized with this pod. The cause of the unusual pigmentation is not yet known. It could be the Chediak-Higashi syndrome, but researchers hope to get a closer look at Iceberg to see his eye color. O. orca have a complex social structure, including matrilineal family clans, pods consisting of several families, and much larger super-pods. 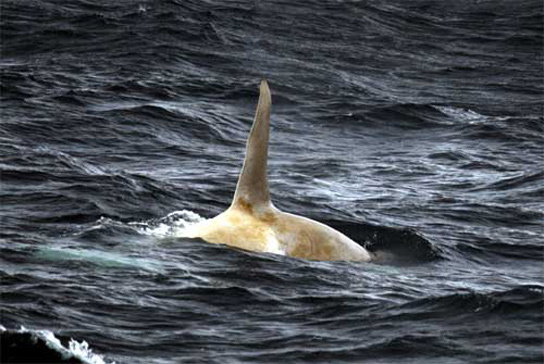 Be the first to comment on "Adult White Killer Whale Spotted in the Wild for the First Time"